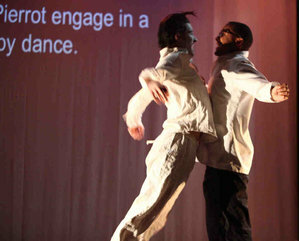 Matteo Scammell , left, as Pierrot, with Brandon Sloan. How likely is it that the commedia dell’arte character Pierrot, a passel of peculiar primatologists, and a chimp could come together in the same story? It happened last weekend at Community Education Center in Sonso, Simians & Pierrot, a physical dance-theater piece by the center’s New Edge resident artist, Marcel Williams Foster, who tied them up in a neat little package – and in the funniest kind of way. As we enter the performance space, five “scientists” in lab coats greet us and we realize we are playing attendees at a conference. They hand out graphs, direct us to a refreshment table, and introduce their leader, Dr. Kathryn Schwartz (Jenna Horton), themselves, and their specialties: One is an American Sign Language (ASL) expert. You may recall the 1970s experiment with baby chimp Nim Chimpsky, reared with a Manhattan family and taught to sign. Riffing off this event, Foster has his scientists invite audience members to the stage; they are taught the ASL for food and attempt to teach the sign to the chimp. But unlike Chimpsky, this monkey, named Chunky, refuses to sign – until Scammell, as Pierrot, enters. Lately we’ve seen a lot of small salon-style dances – often in people’s living rooms – that take place so close to the audience that it’s difficult to tell the difference between performer and viewer. But the loft residence of dancer/choreographer Megan Bridge and composer Peter Price occupies the whole top floor of the building housing Mascher Space Co-op (of which Bridge and Price are members) on the first floor of 155 Cecil B. Moore Ave.
During the weekend, they presented three “choreographies” in the performance space across from their living room, which they had just retrofitted with nifty interior storm windows, rendering the space (and concept) – which they call “fidget” – less frigid. The couple hosted Washington-based dancer/choreographer Kelly Bond and dancers Lillian Cho and Melissa Krodman in their performance work Elephant, seen at the 2010 Philly Fringe festival. As a philosopher, Wittgenstein is suggestive; as a writer, his ideas and use of language can be startling. For me, ideas are like trees: some are always in the same place and they grow and change as thoughts, like leaves take shape and fall way. A few ideas develop and are deeply rooted. Squirrels and birds take residence and write novels. Insect tribes trace their own alphabets and develop ecosystems with the lives they lead inside. They write elaborating texts on the skin and bones of the tree. Bark is the cover of a book, branches spiral into libraries, leaves, leaves. leaves. The trees flourish or just stay there, necessary, decorative; some are hidden by other trees, depending upon which way you walk. In forests, trees have friends and family. There is also the wind, a character in every outdoor performance. It is motion and indifferent to what a tree looks like after it passes. The trees of my imagination catch poems and songs from the breezes, bend in the gales and twist when a sheet of wind leaves surprises in the leaves. “There was a time when the trees were people and the people trees,” I once wrote, not having the slightest notion what that meant. Around that time I came to understand how trees can walk, and I like the sound and idea of that sentence, but I do not understand it anymore. Sometimes, the words just work together without out knowing why. Alphabets, trees, words, walking, Wallace Stevens, Wittgenstein, memories lost, found, lost again, maps, books, magic, stones, statues – which might as well be trees – these are dances and sites on the streets and paths of my wanderings over the years. There are other pieces in the puzzles of my concentration and certain explanations that are usually neither certain, nor explanations. Music is always present. Walking can be ordinary or magical. I wish I knew more and had other words, other things to say – about love, for instance – but it is impossible to remember every leaf, trees from forests, the arcane geometries of branches. Walt Whitman told of finding an oak growing in Louisiana. He “broke off a twig with a certain number of leaves upon it, and twined around it a little moss, And,” singing, “brought it away— and I have placed it in sight in my room.” Some of us do the same with bit of paper or stones. “Ideas too sometimes fall from the tree,” Wittgenstein wrote, predictably. By the way, some of the lines in the text are from Wittgenstein’s writings. He would probably think this entire project is nonsense. Freud would have other explanations, for certain. “Who Walks,” just like the Mounds Bar and Almond Joy, is “indescribably delicious.” Indescribable, because it is difficult to pay proper homage in only a few words to the ArtSpace West dance and theatre performance created by Arthur Sabatini, an associate professor in the New College of Interdisciplinary Arts and Sciences. Delicious, because it emcompasses so many art forms in a single setting. Mark your calendar for this Saturday (March 5), 7:30 p.m., in ArtSpace West on the second floor of the West campus University Center Building (UCB), and see for yourself. 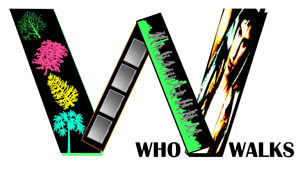 “Who Walks” is a continuation of Arthur (AJ) Sabatini’s 2008 play, “Certain Explanations: Magical Walking,” which debuted at Second Stage West on ASU’s West campus. The performance takes up the original “Magical Walking” story scripted by Sabatini. This latest offering features dance, music, conversation and video in a tale of a mysterious woman in a cape, who resembles an ancient statue and moves in the thoughts of a man writing at his desk. Crowds appear and walk as if in a memory coming alive. Sabatini’s creation is a multi-media collaboration with Philly-based composer Peter Price, dancer Megan Bridge and Phoenix videographer Robert Kilman. For the rest of the story and more information, click here.